Representation can enliven well-worn formulas, placing new cultural lenses into familiar frames. While there have been plenty of movies about misfit teenagers guided by a good-hearted underdog teacher, there are fewer about misfit teenagers in a mostly Latino school in Arizona who are guided by a good-hearted underdog teacher as they compete in a robotics contest while dealing with immigration issues. This cultural specificity gives Spare Parts a substantial line of credit, though it’s a little too hyperactive to spend it well. Based on a Wired magazine article with the vastly superior title “La Vida Robot,” the movie combines two real-life mentors into Fredi Cameron (George Lopez), an engineer who takes an unlikely substitute-teaching gig at an overcrowded Arizona high school. It isn’t clear exactly why he does this, even after a predictable late-movie revelation about his haunted past. 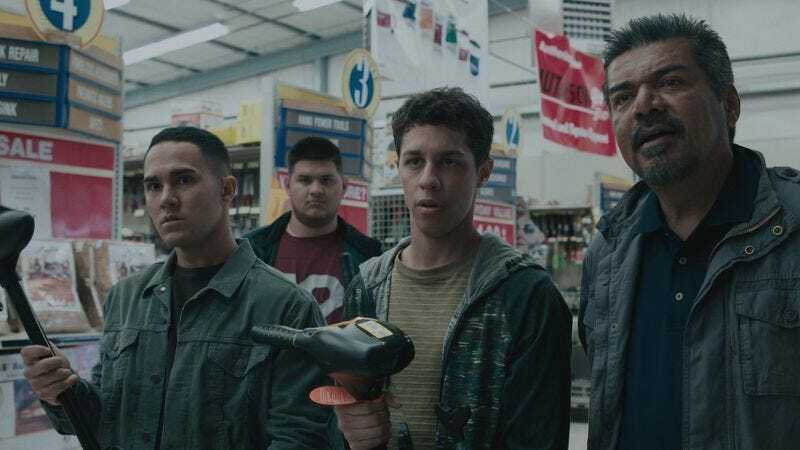 But when disciplined but undocumented Oscar (Carlos PenaVega) pleads with him to hastily form a school robotics team to fill the void (and job prospects) left by his inability to join the military, Cameron agrees. They eventually recruit computer nerd Cristian (David Del Rio), mechanical whiz Lorenzo (José Julián), and stuff-lifter Hector (J.R. Villarreal), and set about building an underwater robot. Director Sean McNamara has a history with Disney Channel sitcoms, and it shows in his breakneck pacing; if rushing equaled efficiency, Spare Parts would be an engineering marvel. Instead, sequences and scenes end unceremoniously, everyone in the movie seems to know each other’s backstory before they’re properly introduced, and mild jokes land with uncertainty. In its mad hurry, the movie denies itself its own genre pleasures—chiefly, the ways assembling a ragtag robotics team and an equally ragtag robot might add a little bit of Mission: Impossible or MacGyver dynamics into a sports-style narrative. McNamara seems to sense this without dramatizing it; there are almost as many shots of the crew walking together in a row as there are scenes of them actually talking to one another. 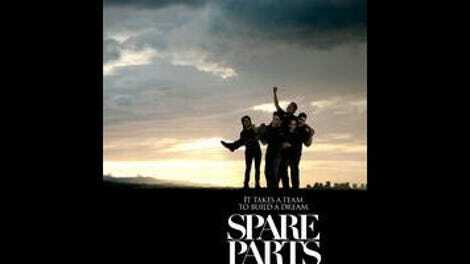 In fact, Spare Parts forgets to show the characters actually becoming friends; at one point, tough Lorenzo comes to the aid of a bullied Cristian, and the movie gets in and out of the scene so fast that it fails to make any impact. When the characters do talk to each other, the tempo of the dialogue is halting and uneven, an uncomfortable mix of exposition and awkward pauses. Rather than coming off naturalistic, the actors sound out of sync with each other. In its final stretch, Spare Parts slows way down, giving it an oddly elastic feel for the passage of time. This dashes any hope that the movie’s careless speed will at least allow it to zip past many items on the underdog teacher/underdog student checklist. Instead, it makes time to better appreciate recognizable scraps of subplot like stubborn protestations from parents, a romantic crisis, an empty threat to draw the teacher away from the students, and other assorted last-minute setbacks. But McNamara does wring some suspense out of the robotics competition itself; the actors are likable (even if Lopez can’t stop cracking ultra-wan jokes) and easy to root for in a novel contest. The movie also has value by making clear how every step of this process was a struggle for these kids, in a way that it wasn’t for the more privileged teams from MIT or Cornell, right down to scraping for meager funds to buy parts at the hardware store. Odd that none of the characters go to McDonald’s while fundraising, because it was obviously a game promotional partner for this movie, wherein multiple characters eat prominently displayed McDonald’s food and one even talks about the importance of McDonald’s in his immigration story (while sitting in a McDonald’s, naturally). It’s a strange moment that encapsulates the Spare Parts game plan: moments of hurried artifice poking through a sweet story.